Dressing up as witches, vampires and other ghoulish things has become increasing popular in Sweden. However, the traditional way of celebrating this time of year is much more serene and romantic. In Sweden, the first Saturday in November is All Saints’ Day – not necessarily November 1st as in most other countries. In 1983, the Sunday after All Saints’ Day was given the official name All Souls’ Day to separate between the saints and the dead. 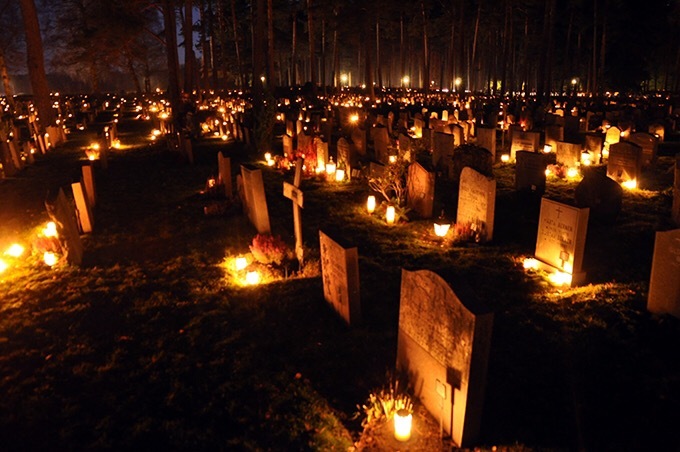 Since the 1800’s Swedes have, during this weekend, made pilgrimage to graveyards up and down the country to decorate the graves with candle light. It is a beautiful experience to walk through the churchyards this weekend. In the pitch black November Nordic darkness, it is a peaceful reminder of those who have gone before us. If you happen to be in Stockholm, head for the Forest graveyard (Skogskyrkogården) for a specifically spectacular experience.